My son has his Confirmation today. This is such an important, but often overlooked sacrament. 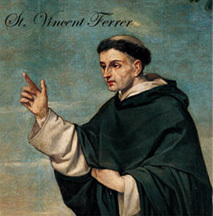 Here is what the great St. Vincent Ferrer had to say about confirmation and its importance in the latter days. "In the days of peace that are to come after the desolation of revolutions and wars, before the end of the world, the Christians will become so lax in their religion that they will refuse to receive the Sacrament of Confirmation, saying, 'It is an unnecessary Sacrament. '; and when the false prophet and the Anti-Christ comes, all who are not confirmed will apostatize, while those who are confirmed will stand firm in the faith, and only a few will renounce Christ."